We design and handcraft our products individually to be unique. All French Bullevard products are exclusive and made per order, and we do not hold stock of ready to wear jewelry or chains. We source all our raw materials in New York City, and partner exclusively with local businesses for bringing our collections to you. We are thankful to be able to rely on the Big Apple’s richness of talent and cultural diversity to feed our creativity. To find your pets neck size, simply measure your pooch’s neck with the help of a measuring tape. When measuring the length and one finger if necessary to find the optimal size. Please note that for the Jewelry & Necklaces collections, you can use the extender chain to adjust the collar to the right length. 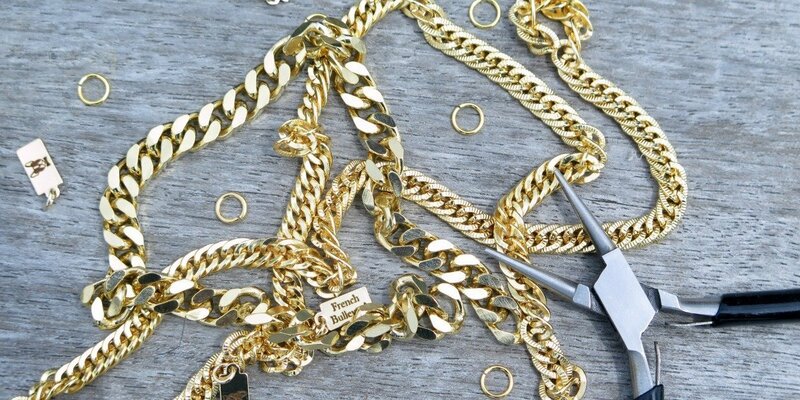 Each necklace or jewelry can be extended by up to 2 inches(5.08cm), except the Dog Chains Collection. We securely accept all majors credit cards through the secure platform Stripe, this is our current payment method to insure the maximum security to our customers. The credit card data entered into your payment form is never sent to our server. Instead, the data is sent directly to Stripe. We would like to remind our customers that our products are for decorative use ONLY and cannot be used with a leash or outside its main purpose. No leash should be attached to the items under any circumstance. Also, our jewelry items do have small pieces, thus, they should ONLY be worn under supervision. Our products are not meant to be worn 24/7, they are a decorative add-on for outdoor strolls and for special occasions..
We will not be held responsible and or liable if the products are not used in accordance with our Terms and Conditions. The use of the product and safety of the pet and handler is completely at the purchaser and/or user’s discretion and responsibility. Also, our jewelry is not intended to be worn in heavy heat or under a long exposure to the sun. French Bullevard products are designed and manufactured with the most elevated quality materials and standards. Proper care of your jewelry piece will guarantee the life span of your piece. French Bullevard necklaces must be treated carefully as you would with your own favorite jewelry. Therefore, it should not be exposed to water or other harsh conditions. Also after use make sure to place your doggie’s French Bullevard jewelry in its pouch for maximum protection. Jewelry can be polished with a soft cloth to help keep its beautiful shine. If you cannot find your dog’s size, please send us a message we might be able to accommodate you! Note: Fees will apply for size larger than 17 inches. Also, our jewelries can be worn by humans too, we would love to make one for you:)! It would be great to share the pleasure with your pooch! Please write us a message here for special demands! We usually ship within 7 days, but depending on the current demands, it can take up to 3 weeks for the item to be crafted and shipped to you. If your order is urgent or if it is a gift you are sending, feel free to add comments in your order’s note, and we will accommodate you. We only offer returns for defective items. We remind you that every item is unique and handmade upon order for your doggy. If you have doubts or questions before purchasing a necklace please feel free to Contact Us beforehand. However, if the product is defective, contact us within 7 days of the receipt via the Get in Touch Form to see if you are eligible for a return. Original shipping fees are non refundable, however, we offer free returns, and we will provide you a free returnable label. Once we receive the item we will make sure your item will be replaced rapidly. We currently offer international shipping through USPS, which ensures the package will be delivered to your local mail carrier. It is the most cost-effective solution available to you for receiving your package. French Bullevard is thus not responsible for any lost mail and will not provide any refund. However, if you would like to insure your shipment, we can offer insurance at an additional cost. This would allow you to be refunded if your package is lost in transit. Please Contact Us after you placed an order to receive more information about insurance options available to you.